In this category we will hand engrave initials on a ring in the following styles, all of which are illustrated on the right. Script, Roman, & Old English. An open and a shaded form of these styles. A Monogram designed for you or by you. This image will enlarge. A link to this illustration is available in each product page. 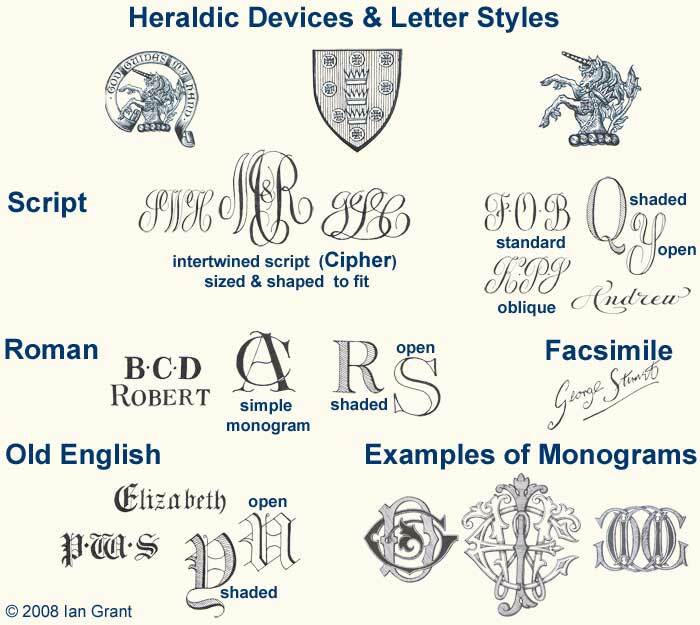 You will find more examples of Monograms in our engraving section. These sizes and weights (in grams) are for comparison only. They are the dimensions and weights of the stampings that we buy from our bullion merchants and are an estimate by them. We explain the die stamping and forging process in our introductory page about signet rings, so you will appreciate that once we have prepared the ring and sized it to your finger the dimensions and weight will not be precisely as indicated above. On the XL oval ring (Ring Ref 1), for example, the depth of the head and its width and height will, typically, reduce by about one millemeter and the smaller the finger size that we have to fit to the more reduction there may be (because the head will bow as it is reduced in size and will have to be filed and beaten flat). In consequence, the weight will also reduce. we include information about the silver and gold rings that we offer, including details of the weights and sizes.